Background: A proliferating trichilemmal cyst (PTC) is an uncommon, rapidly-reproducing cutaneous epithelial cyst, differentiating from the isthmic portion of the outer hair root sheath. It is usually described as a benign tumor, but malignant transformation has been reported and is then denominated as a malignant proliferating trichilemmal tumor. Ki67 immunostaining has been used as a methodology for the evaluation of tumor grade in other tumors, due to its distinctive reaction patterns which exclusively involve proliferating cells. Objectives: (1) To report the incidence of cases of PTCs in a General Hospital during a 12 years period. (2) To determine the expression of ki67 using immunohistochemical staining. (3) To correlate ki67 reaction patterns with clinical prognosis. Materials and Methods: The dermatology department's files during a period of 12 years were reviewed; cases with a diagnosis of PTC were selected, and ki67 immunostaining was done when enough biological material was available. Results: A total of 15 cases with a diagnosis of PTC were identified. In 12 cases, ki67 immunostaining was carried out. In 9 of the 12 cases, ki67 was observed in the basal cells of the cystic epithelium, one case was moderately positive in palisading epithelial cells; in the other two cases ki67 immunostaining was negative. Clinical follow-up was done and revealed that no patient had local recurrence in 5 years after surgical removal of PTC. We therefore consider this immunostaining technique is probably correlated with low recurrence potential. 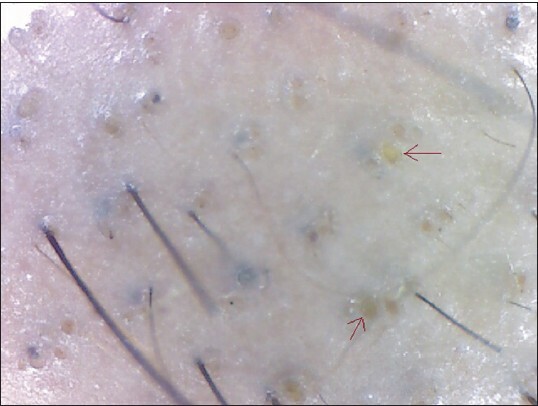 Background: Dermoscopy of the scalp (trichoscopy) is a technique to evaluate the skin of the scalp and the hair disorders. It clinically helps to establish early female pattern hair loss (FPHL) without the need for more invasive techniques. Objectives: This work intends to demonstrate new adjunct criteria for the clinical diagnosis of FPHL by determining the number of short vellus hairs encountered in the frontal area of the scalp of female patients with FPHL. Materials and Methods: We retrospectively reviewed the trichoscopy images from 45 women affected by FPHL in initial stages, at 20 fold magnification dermoscopy at 2 cm from the hairline into the frontal area of the scalp. Results: A total of 45 patients images included had more than 20% variability at dermoscopy, criteria utilized to diagnose and included them in the study. All patients were graded as Ludwig I severity, 14 patients had frontal accentuation. 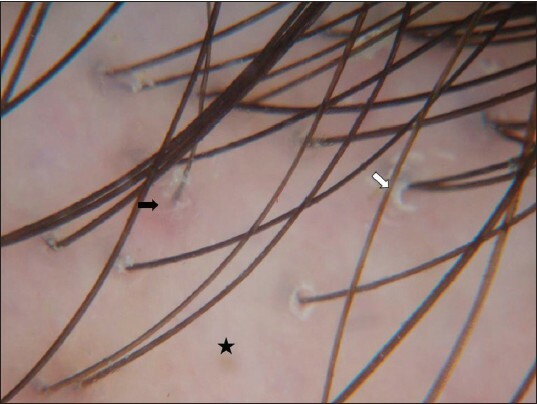 The average number of vellus hairs in the frontal area at 20-fold magnification of all patients was of 12.02 vellus hair in the frontal area. When comparing the Ludwid I pattern group versus the Ludwig I with frontal accentuation pattern group there was no statistical difference between the two clinical groups. Conclusions: All 45 patients analyzed in this study were clinically diagnosed with FPHL. 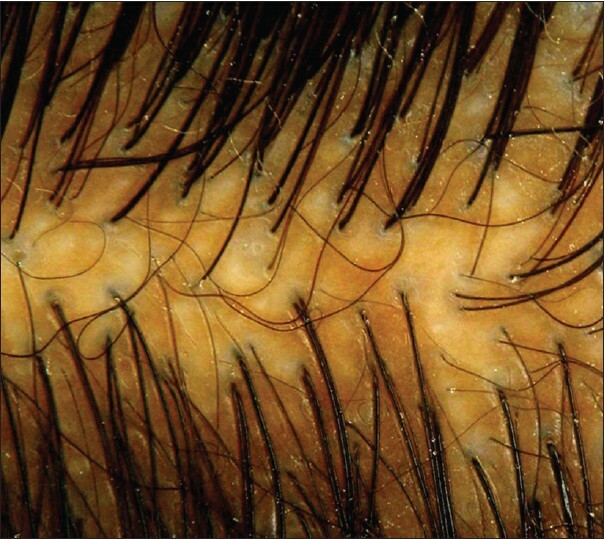 The number of vellus hairs in the frontal area was greater than the average found in normal subjects. Most patients (80%) with FPHL had more than or equal to seven vellus hairs per 20-fold magnification field in the frontal area, therefore we suggest that the presence of more than 6 vellus hairs in the frontal scalp at 20-fold magnification can be used as an additional criterion of FPHL. 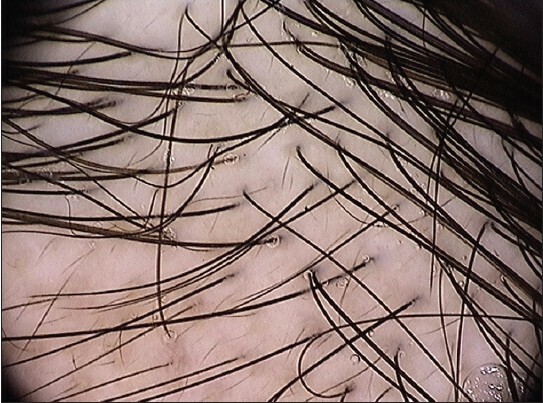 Background: Female pattern hair loss (FPHL) presents with visible patterns of hair loss, thus making a bedside diagnosis possible. However, there are cases of FPHL presenting without any visible hair thinning, making it necessary to subject them to a scalp biopsy to make a diagnosis. 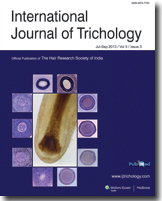 Aim: The aim of the following study is to determine if trichoscopy can be used as a bedside tool to diagnose Early FPHL in women presenting without any visible thinning of hair, using >20% hair diameter diversity - anisotrichosis, as the diagnostic criteria. Materials and Methods: Trichoscopy was performed on 20 cases of early FPHL (biopsy proven), 63 normal controls and 29 Grade 2 FPHL Controls. Results and Discussion: In the biopsy proven FPHL cases, 75% showed anisotrichosis on trichoscopy. This finding was significantly higher in FPHL Cases compared to normal controls. As expected, 93% of Grade 2 FPHL controls also showed the same finding. Trichoscopy was found to be 75% sensitive and 61.54% specific in diagnosing early FPHL. Thus, a negative result would be more indicative of absence of disease, however, a positive result would not always indicate the presence of disease. 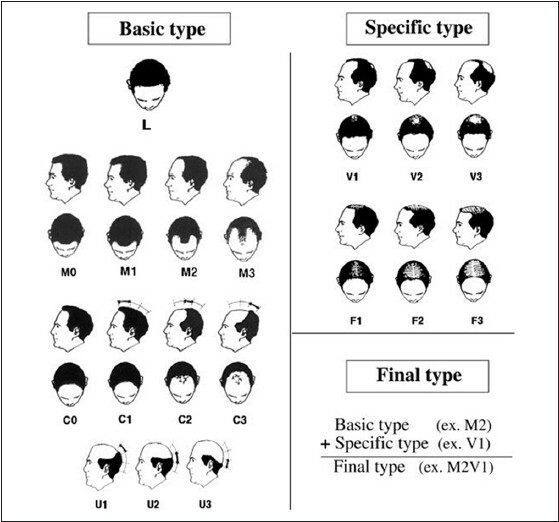 Context: Several classifications for pattern hair loss (PHL) have been used over the years. The Norwood-Hamilton classification for men and Ludwig's classification for women is used commonly, but they have their limitations. Aims: The objective of the following study is to evaluate the efficacy of the basic and specific (BASP) classification in Indian populations . Subjects and Methods: We used the BASP classification to classify the PHL in the patients visiting our out-patient department in the period from June 2012 to May 2013. 763 patients were classified out of which 313 were females and 450 were males . Results: The majority of the female patients were in the 3-5 th decade of life and in males were in 4-6 th decade. Conclusions: The BASP classification is, easily remembered, reproducible classification for the diagnosis and treatment for both male and female pattern alopecia. Background: Dermatoscopy is a new noninvasive tool for the diagnosis of various skin and hair disorders. Dermatoscopy of alopecia areata (AA) shows various specific features, which may aid in confirming the diagnosis. Aims: The aim of this study was to determine the various clinical patterns and the dermatoscopic features of AA. Materials and Methods: A total of 75 patients of AA were evaluated with a dermatoscope (magnification ×25 and ×60). Results: The mean age of onset of AA was 23.58 years. Males were more commonly affected. Scalp was most commonly involved. Patchy alopecia was the most common pattern observed. 10 patients showed concomitant nail changes. The dermatoscopic features included yellow dots (YDs) in 43 (57.33%) patients, black dots (BDs) in 63 (84%) cases, broken hairs (BHs) in 28 (37.33%) cases, short vellus hair (SVH) in 51 (68%) patients and tapering hair (TH) in 14 (18.67%) cases. Conclusion: The most common dermatoscopic finding observed was BDs, followed by SVHs, YDs, BH and TH. Background: Hardness of water is determined by the amount of salts (calcium carbonate [CaCO 3 ] and magnesium sulphate [MgSO 4 ]) present in water. The hardness of the water used for washing hair may cause fragility of hair. Objective: The objective of the following study is to compare the tensile strength and elasticity of hair treated in hard water and hair treated in distilled water. Materials and Methods: 10-15 strands of hair of length 15-20 cm, lost during combing were obtained from 15 volunteers. Each sample was cut in the middle to obtain 2 sets of hair per volunteer. One set of 15 samples was immersed in hard water and the other set in distilled water for 10 min on alternate days. Procedure was repeated for 30 days. The tensile strength and elasticity of the hair treated in hard water and distilled water was determined using INSTRON universal strength tester. Results: The CaCO 3 and MgSO 4 content of hard water and distilled water were determined as 212.5 ppm of CaCO 3 and 10 ppm of CaCO 3 respectively. The tensile strength and elasticity in each sample was determined and the mean values were compared using t-test. The mean (SD) of tensile strength of hair treated in hard water was 105.28 (27.59) and in distilled water was 103.66 (20.92). No statistical significance was observed in the tensile strength, t = 0.181, P = 0.858. The mean (SD) of elasticity of hair treated in hard water was 37.06 (2.24) and in distilled water was 36.84 (4.8). No statistical significance was observed in the elasticity, t = 0.161, P = 0.874. Conclusion: The hardness of water does not interfere with the tensile strength and elasticity of hair. Objective: The objective of the following study was to assess the knowledge, practice, perception and adverse reactions among hair dye users. Settings and Design: A cross-sectional study was conducted on patients, their attenders and staff of SDUMC. Materials and Methods: A questionnaire (28) pertaining to use of hair dyes and reactions to them was administered randomly. Statistical Analysis: The demographic data are expressed as mean ± standard deviation, quantitative data expressed as percentages. Results: A total of 263 volunteers responded of which 52.5% and 47.5% were females and males respectively with mean age of 32.40 ± 6.01 years. The participants started using hair dye at an age of 27 (±3.63) years. Synthetic dyes were used by 91%. Frequency of use in a year was 2-5 times in 51%. Instruction of the package insert was followed by 63.5%. Skin test was never performed in 34% prior to their use. Nearly 96% expressed hair dyeing was unsafe during pregnancy, lactation and in children. Adverse reactions were reported by 42%, with headache (63%) and itching (38%) being the most common. Conclusion: Hair dyeing was started at very early age. 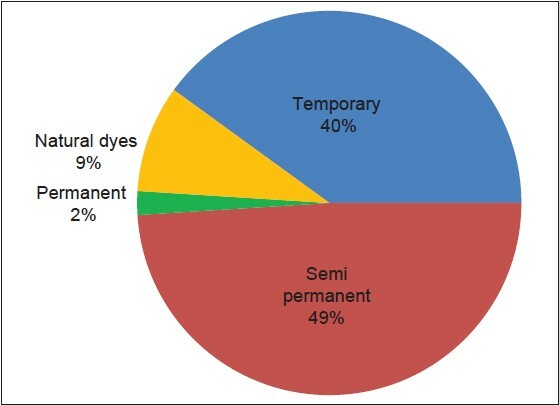 Majority used semi-permanent dyes even though they perceived natural dyes were safe. They continued dyeing despite adverse reactions, which indicates cosmetic importance. Context: Eyelashes play an important role in one's personality and builds confidence. Now-a- days, mascaras are used very commonly as an eye cosmetic. Mascara induced loss of eyelashes has been evaluated in this study. Aim: The aim of this study is to determine the effect of mascara on eyelashes and to find an association between the usage of mascara and fall of eyelashes. Settings and Design: Cross-sectional questionnaire based study done on medical students. Subjects and Methods: Medical students were interviewed with a semi-structured questionnaire on mascara usage. Statistical Analysis: MedCalc 9.3.6.0 version. Results: A total of 128 medical students who used mascara were included in this study. Mean (standard deviation) age of the students was 23.7 ± 2.0 years. Nearly 31% of the subjects faced the eye problems. Eyelash fall was observed in 19%. Higher mean years of use of mascara (5.17 ± 3.8 vs. 3.19 ± 2.6, P = 0.027, t-test) influenced the fall of eyelashes in the subjects. Itching of the eye prior to fall of eyelashes was observed in all subjects ( P = 0.0002, Fisher exact test). A higher percentage of eyelash falls was observed in subjects who used water for removal of waterproof mascara (27%). Conclusion: There is a significant positive association between long-term use of eye cosmetics like mascara and fall of eyelashes. Furthermore, use of water for removal of waterproof mascara was associated with a higher incidence of eyelash fall. Aim: The aim of the present study was to determine whether hair could be used as biomarker of fluoride exposure. Materials and Methods: The study was carried out on 30 people living in an endemically fluoridated area and a low fluoridated area. Samples of hair from the occipital were taken and subjected to fluoride analysis by a fluoride ion electrode. Results: Lower fluoride levels in water supplies correlated with lower levels of fluoride in hair and more over higher fluoride levels in water correlated with higher levels of fluoride in hair. A direct relationship was evident between fluoride levels in water supplies and concentration of fluoride in hair (P < 0.01). Conclusions: The results of the present study indicate hair can be used as an indicator of fluoride exposure. Introduction: Frontal fi brosing alopecia (FFA) in an entity characterized by the recession of the frontotemporal hairline (FTHL) with alopecic scarring change. In recent years there are numerous articles discussing the usefulness of dermoscopy for the clinical diagnosis of different types of scarring alopecia. 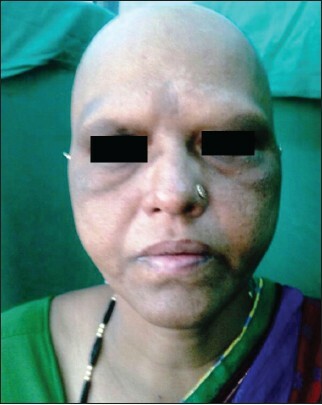 Materials and Methods: We value 79 patients diagnosed with FFA, evaluating some trichoscopical findings described as typical for FFA: Absence of follicular opening, follicular hyperkeratosis, follicular plugs and erythema. Results: In a population of 79 women, 100% showed no follicular opening, 72.1% follicular hyperkeratosis, 66.3% perifollicular erythema and 44.8% follicular plugs. Thus, 100% of patients had at least one of the dermoscopic elements described as suggestive of FFA, 53% two of them, 45% three and 27%, all those elements. 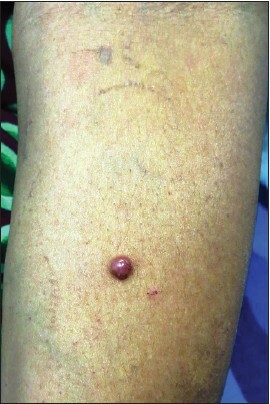 Perifollicular erythema was present in 95% of cases in which the disease was active. Conclusions: We consider that the presence of perifollicular erythema will be a direct marker of FFA activity. Eye brows are essential for esthetic and functional purposes. Various kinds of eye brows are found in human species. Protective function is one of the important functions of eye brows. Double eye brow is a very rare condition found in human. This case report describes one of the rare cases of double eye brow. Pemphigus vulgaris is an autoimmune disease, which leads to flaccid bullae and erosions. Although the scalp is commonly involved, hair loss is rarely seen. We herein report a case of 32-year-old female patient with a 2-year history of pemphigus vulgaris, involving the skin and mucosa. Although clinical improvement was achieved with oral corticosteroids and mycophenolate mofetil, the patient developed tender plaques on her scalp, accompanied by hair loss. Histopathology and direct immunofluorescence were consistent with pemphigus vulgaris. Skin swab cultured Staphylococcus aureus. Treatment with oral and topical corticosteroids combined with mycophenolate mofetil resulted in clinical remission, with regrowth of scalp hair. 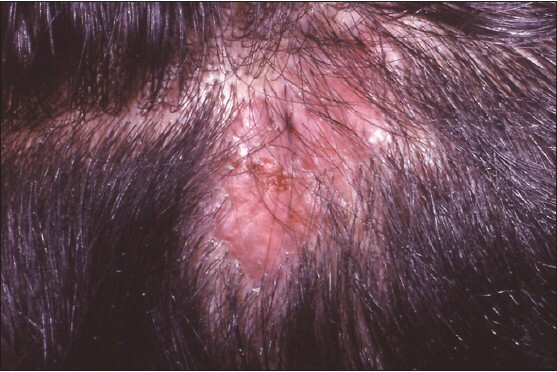 Alopecia is an unusual clinical manifestation of pemphigus vulgaris. Our case supports the hypothesis that hair loss is induced by antibody-mediated outer root sheath keratinocyte acantholysis, in combination with skin infection, that together lead to the observed hair loss. Trichorhinophalangeal syndrome (TRPS) type I is a rare autosomal dominant disorder, caused by mutations in the TRPS1 gene. 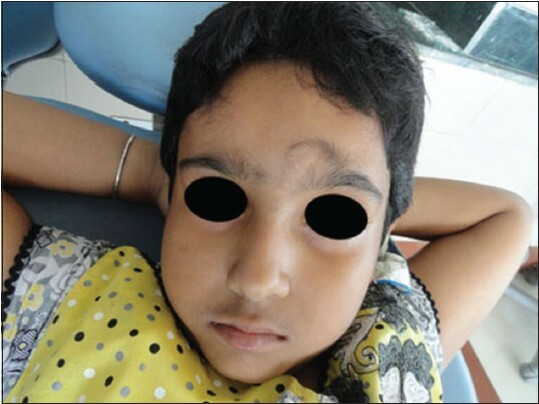 It is characterized by slowly growing hair, craniofacial manifestations and orthopedic abnormalities. 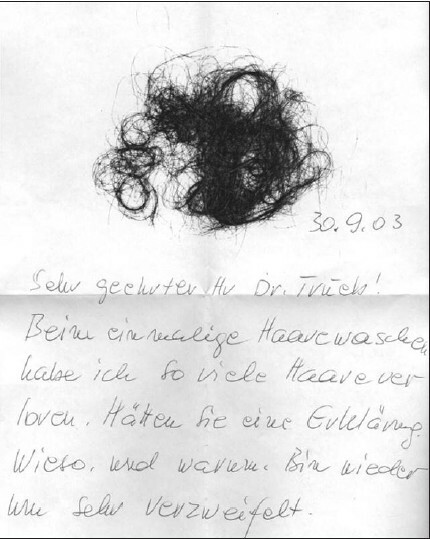 We present a 17-year-old female of Ukrainian origin who presented to the hair clinic with the complaint of hair loss. Further examination revealed the presence of craniofacial features characteristic for TRPS type I. Sequence analysis of the TRPS1 gene revealed a novel c. 2396_2397 insG frameshift mutation in exon 5, leading to a premature stop at codon 800. 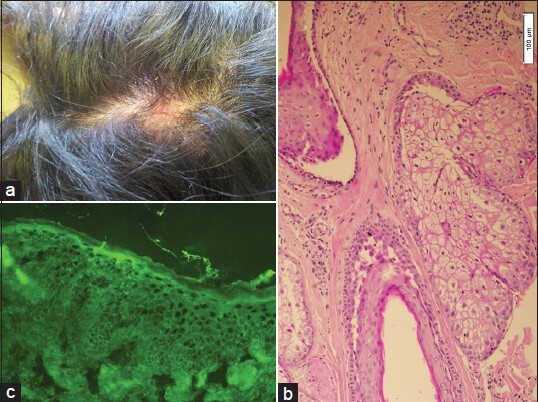 This case underlines the importance of the hair phenotype to the diagnosis of this syndrome and emphasizes the fact that when encountered with a severe alopecia in young age, the possibility of a congenital hair disease should always be borne in mind.